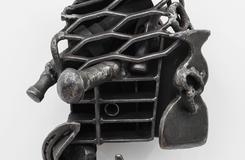 Melvin Edwards included in the exhibition Necessary Force: Art in the Police State curated by Karen Fiss and Kymberly Pinder, in the University of New Mexico Art Museum. The exhibition Necessary Force: Art in the Police State addresses the systemic forces in history and society that continue the violation of civil rights in this country through a range of issues, including police brutality, surveillance and imprisonment, poverty, gun violence, racial profiling, as well as the power of collective protest and collective healing. The exhibition includes seminal photographs documenting the civil rights movement from the Museum's own collection. In conjunction with the exhibit, the museum will host a diverse program of public events with the participation of artists, scholars, law enforcement and local organizations to discuss some of the foremost civil rights issues facing the communities and nation today. Artists included in the show: Josh Begley, Larry Clark, Max King Cap, Mel Chin, Nani Chacon, Nick Cave, Center for Tactical Magic, Melvin Edwards, Anita Luttrell Fields, Harun Farocki, Jacque Fragua, Harry Gamboa/ASCO, Thomas Greyeyes, Nicholas Herrera, Laura Kurgan, Danny Lyon, Jeremy Mende, Charles Moore, Otabenga Jones & Associates, Trevor Paglen, David Reinfurt, Dread Scott, Hito Steyerl, LaShawnda Crowe Storm, Charlene Teters, David Taylor, Hank Willis Thomas, Kara Tromp, William Karl Valentine, Andrew Wilson, Bernard Williams, Nafis M. White.